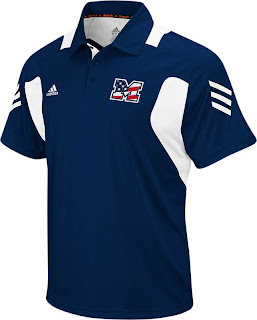 ...the Michigan coaches and staff are sporting these threads on the sideline this Saturday. Thanks to some digging by Greg from MVictors, we have confirmation that ONLY coaches and staff will have custom gameday outfit. Players' unis will be unchanged. 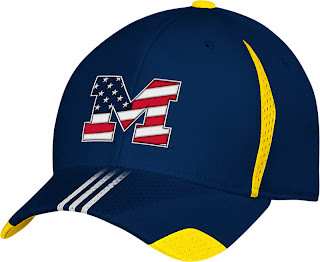 ANN ARBOR, Mich. -- University of Michigan head football coach Rich Rodriguez and select sideline personnel will wear special edition red, white, and blue themed apparel and headwear this Saturday, Sept. 11, 2010, during their game against Notre Dame in South Bend. The Irish coaching staff will also be wearing similar apparel for Saturday’s 3:30 p.m. matchup at Notre Dame Stadium. The ‘Stars and Stripes Collection’ by adidas, was designed as a way of showing American pride and honoring the men and women that help keep America safe. Other universities that will be wearing items from the adidas ‘Stars and Stripes Collection’ this Saturday include: Cincinnati, Kansas, Louisville, Nebraska, Notre Dame, North Carolina State, Tennessee, Texas A&M and Wisconsin. Michigan fans can purchase the special edition polo, t-shirt or hat at any M-Den retail location or online at www.mgoblue.com. I get that 9-11 is a big deal, and we should all remember, but it has very little nothing to do with this game, or sports in-general. I think this shirt and hat look goofy and I don't like it. But that's just me. I like them for Memorial Day and Fourth of July. That's actually good for them. It'll make them more professional while playing that sport.